If you’re looking for the one story that talks about how a certain Villanova junior wing player named Josh Hart became molded into someone who plays as hard as anyone in college basketball, then you’ve found the right page to pick up the story from. 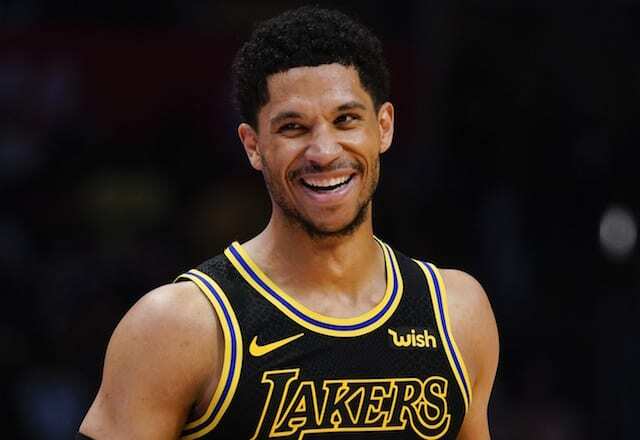 Keep reading as we bring you details about Josh Hart, his parents, biography, height, weight and body measurements. An American by nationality, Josh is a professional basketball player, born on the 6th of March 1995 in Silver Spring, Maryland in the United States of America. He plays as a shooting guard for the Los Angeles Lakers of the National Basketball Association (NBA). Josh Hart attended the Sidwell Friends School at Washington D.C for his high school education before proceeding to Villanova for his college education; playing basketball all through both schools. After his freshman year in high school, Josh Hart was on a Boy Scout camping trip one summer when he heard the news that his parent’s house had been burned down. An electrical mishap which started from a power strip in the living room engulfed the kitchen and into the dining room, burning many facilities and equipment before firefighters could put it out. Though nobody was in the house when the fire started, the family dog was killed and all their belongings were gone. The family lost virtually everything they owned. In the aftermath of the inferno, Josh and his family lived in a hotel, squeezing themselves into a two-bedroom apartment with the parents in one room, Josh and his sister in another, and Josh’s older brother on the living room couch. The troubles became evident in school where poor study habits resulted in low grades and ultimately, physical stress that kept Hart out of school for days at a time. Basketball became his perfect escape. Unknown to Josh, his time at Sidwell High School was already running out. It didn’t matter that he was the second-leading scorer for the Quakers’ basketball team, helping them win a share of the Mid-Atlantic Conference title by averaging 15.6 points per game. With his low grades in class as well as trouble adapting to the school’s rules, Josh felt like a lost little kid. He would most times put his head down on his desk when things seemed far too heavy for him in class. Josh Hart was already giving up. He had already begun formulating plans to enroll at Montrose Christian at the close of his sophomore year when he received a note from the headmaster expelling him from Sidwell for poor academic performance. Josh was devastated, but friends and parents at Sidwell were having none of that. They began writing series of letters and emails to the school, flooding the headmaster’s inbox with protests and petitions against Josh’s expulsion for two months, and even creating a Facebook page called “Let Josh Stay” until it was reversed. In addition, an involved parent known for her zeal for education became Josh’s tutor. He would study for four to six hours a day, and even spend entire weekends at her house, learning how to study the right way. It wasn’t that Josh didn’t have the intelligence; he just didn’t have the same work ethic in school that he has in basketball. With time, his grades began to improve. His confidence did too. Josh’s academic rise became even more evident on the court: not only was he averaging 25.2 points for the Quakers, he began exhibiting improved leadership abilities and teamwork. His professional career began in 2017 when he was selected with the 30th overall pick by the Utah Jazz, before getting traded to the Los Angeles Lakers on draft night. He has been able to receive a host of awards and honors including NCAA champion (2016), Consensus first-team All-American (2017), Third-team All-American – NABC (2016), Senior CLASS Award (2017), Julius Erving Award (2017), Big East Player of the Year (2017) among others. Josh Hart’s parents are Moses Hart (father) and Pat Hart (mother). Moses is a chef for a catering company near Washington, while Pat mother is a waitress at a country club. Josh has two siblings, and he’s distantly related to Elston Howard. From a young age, Moses instilled in Josh the nerve and courage to play hard for his team, rather than picking or choosing when to play hard. It’s a philosophy that came to be when Josh was struggling academically at Sidwell Friends School and was on the verge of being kicked out of school. Josh’s father had told him that if he didn’t succeed academically at Sidwell, then he wouldn’t be allowed to play basketball anymore. To make this happen, both Josh and Moses began putting up shots, working on ball-handling, and fighting for rebounds. One of the best players in college basketball, Josh has a height measuring 6 ft 5 in (1.96 m), and a weight measuring 215 lbs (98 kg). Being 6-5, not only can he score great points, but he also bangs in with 7-footers by defending the best player on the opposing team. Other details of his body measurements are not available.